It has come to our attention that a rogue botnet is currently using a vulnerability in the RouterOS Winbox service, that was patched in RouterOS v6.42.1 on April 23, 2018. If you never used this service in your router make sure it is disabled. If not means your router is compromised. SOCKS is a proxy server that allows TCP based application data to relay across the firewall, even if the firewall would block the packets. The SOCKS protocol is independent of application protocols so that it can be used for many services, e.g., WWW, FTP, TELNET, and others. make sure to delete all the scripts and check /files and all the folders for mikrotik.php and delete it. Scripting host provides a way to automate some router maintenance tasks using executing user-defined scripts bounded to some event occurrence. Scripts can be stored in the Script repository or can be written directly to the console. The events used to trigger script execution include, but are not limited to the System Scheduler, the Traffic Monitoring Tool, and the Netwatch Tool generated events. Same as the script, check if you have any schedule and remove the unknown one. If you have lots of routers, you could use the below script to clean them all and secure your router. #change the username and password and un comment it. #If you want to keep your username but only change the password uncomment the below command. Change default username admin to a different name; custom name helps to protect access to your router if anybody got direct access to your router. We strongly recommend using the second method or Winbox interface to apply the new password for your router, to keep it safe from other unauthorized access. x.x.x.x/yy – your IP or network subnet that is allowed to access your router. 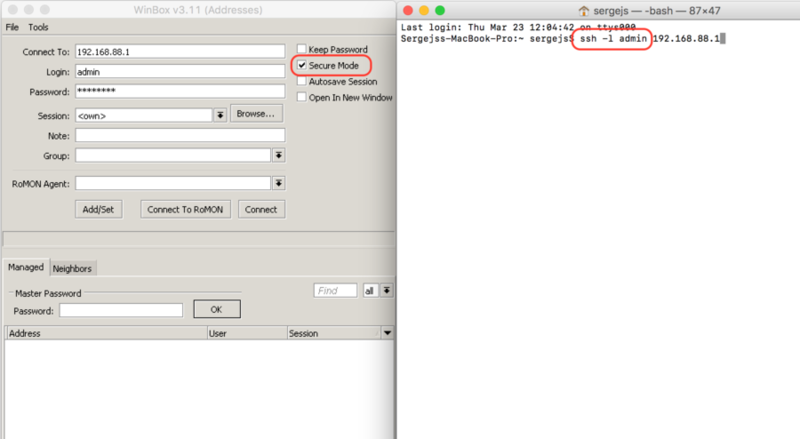 Note: log in to the router with new credentials to check that username/password are working. All production routers have to be administered by SSH, secured Winbox or HTTPs services. Use the latest Winbox version for secure access. RouterOS has built-in options for easy management access to network devices. The particular services should be shut down on production networks. Bandwidth server is used to test throughput between two MikroTik routers. Disable it in the production environment. The router might have DNS cache enabled, that decreases are resolving time for DNS requests from clients to remote servers. In case DNS cache is not required on your router or another router is used for such purposes, disable it. It is good practice to disable all unused interfaces on your router, to decrease unauthorised access to your router. We strongly suggest keeping default firewall on. Here are few adjustments to make it more secure, make sure to apply the rules, when you understand what are they doing.